Factors that maintain genetic and species diversity may act in concert in natural ecosystems. Here, we investigate correlations between genetic diversity (in eight salt marsh species) and community species diversity. A significant positive correlation existed between genetic diversity and species richness, although the relationship was not significant for any species individually. Nonetheless, four of the eight comparisons showed strong positive relationships between genetic and species diversity. Additionally, several abiotic variables were used in a model selection procedure to determine what site-level characteristics might drive differences in genetic diversity in this system. The rate of larval influx, as measured by barnacle abundance on Spartina alterniflora, was the strongest predictor of site-level genetic diversity in our samples. 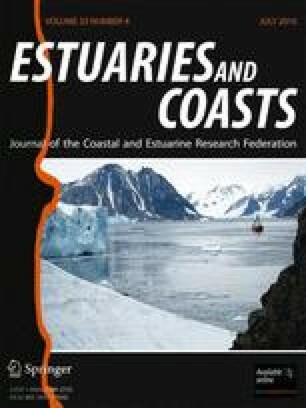 Our results suggest that estuarine management efforts should consider recruitment rates when selecting areas for protection. The online version of this article (doi: 10.1007/s12237-009-9188-2) contains supplementary material, which is available to authorized users. This material is based upon work supported by the National Science Foundation under grant numbers OCE-9982133 and OCE-0620959. Additional funding was provided by the University of Georgia and the National Geographic Society (NGS grant #8351-07). Thanks to R. Miller, M. Cozad, D. Saucedo, M. S. Pankey, the GCE-LTER Schoolyard program, and field researchers at the University of Georgia Marine Institute (UGAMI) for help with field collections. D. Patel helped with DNA amplification and sequencing. Special thanks to T. Bell, S. Small, and C. Zakas for help in the lab and comments on the manuscript. K. F. Robinson was a great help in data analysis and also provided comments on the paper. Additional helpful comments were graciously provided by two anonymous reviewers. This is a contribution of the Georgia Coastal Ecosystems Long-Term Ecological Research program, and contribution number 985 of the University of Georgia Marine Institute. Bishop, T.D. 2007. Mollusc population size distribution monitoring: Fall 2004 mid-marsh and creekbank infaunal and epifaunal mollusc size distributions based on collections from GCE marsh, monitoring sites 1-10. http://gce-lter.marsci.uga.edu/lter/data/gce_data.htm. GCE Dataset: INV-GCEM-0705a. Hodson, R.E. 2005. Surface water bacterial productivity at ten Georgia Coastal Ecosystems LTER sampling sites. http://gce-lter.marsci.uga.edu/lter/data/gce_data.htm. GCE datasets: BCT-GCEM-0511-a-e.
Pennings, S.C. 2000-2006. Fall plant monitoring survey -- biomass calculated from shoot height and flowering status of plants in permanent plots at GCE sampling sites 1-10. http://gce-lter.marsci.uga.edu/lter/data/gce_data.htm. GCE datasets: PLT-GCEM-0303a-c, -0311b, -0501b, -0511b, and -0612b. R Development Core Team. 2007. R: a language and environment for statistical computing. R Foundation for Statistical Computing, Vienna, Austria. http://www.R-project.org.